Homepage. This page: A magazine dating to 1927 edited by Lord Montagu of Beaulieu. The magazine shown here, is one of a set that would be "complete in about 30 fortnightly parts" according to the cover. Edited by Lord Montagu of Beaulieu and Marcus W. Bourdon, "Cars & Motor-Cycles" which was introduced in October 1927, cost 1/3 per issue. The list of contributors shown on the cover included some famous names of the day, including speed aces such as Major H.O.D. Segrave, Captain Malcolm Campbell, the Earl of Cottenham (Alvis exponent), W.L. Handley (motorcycle racer), Fred Dixon (Brooklands regular), Cyril Pullin (a T.T. motorcycle racer), G.S. Davison (motorcycle racer) and Phil Cranmore. Inside the magazine a further list of occasional contributors is given, many of the names I've not heard of but some I have, including S.F. Edge (both record breaker and racing driver, and directory of Napier cars), and J.T.C. Moore-Brabazon, a former racing driver who went on to serve in WW1 with the Royal Flying Corps, and later moved into politics and the aviation industry. The first few pages are given over to advertisements for motor insurance, Dunlop Tyres, the Cooper Stewart motorcycle speedometer, and various motoring books produced by Sir Isaac Pitman & Sons Ltd, who were also responsible for this magazine. 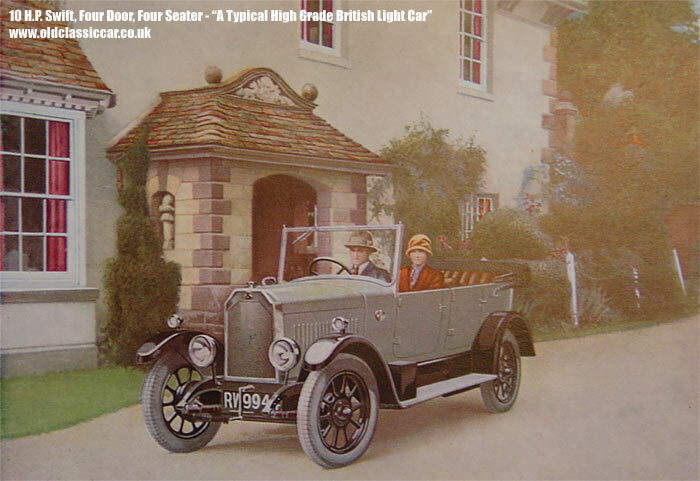 Following this is a colour plate showing a 1927 Clyno 'Royal' saloon, and then the first of the articles. In issue 4 the first article is penned by Betty and Nancy Debenham, shown alongside, and is titled "Diana Awheel - Motor-Cycle Hints and Tips". 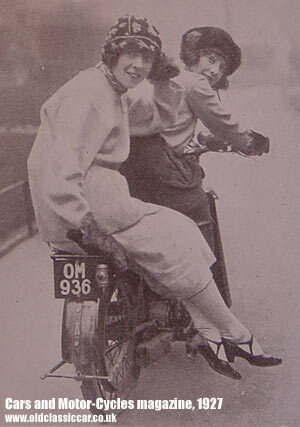 This article attempts to explain the enjoyment that gentle ladyfolk can reap by taking to the road on two wheels, and sets the scene with this opening paragraph: "Motor-cycling is becoming more and more popular amongst women, but there are still many timid souls who hesitate to take the first step to this freedom which so many of us enjoy. This seems all the more sad when we consider that no girl that we have ever met who has once sampled the joys of motor-cycling willingly has given it up". Various aspects of motorcycle ownership are discussed, as is the recommendation that a machine of small capacity is likely to be most suitable to the lady rider. Their advice will no doubt strike a chord with any motorcyclist that has been stuck at the side of a road, vainly attempting to kick their big old bike into life: "A small engine is very much easier to start than a large one, a most important point for the novice. There is nothing more discouraging than to "kick" and "kick" at an irresponsive engine, with lookers-on increasing in number until in despair one wheels the machine round the corner to try again in comparative privacy. One has none of that unhappiness with a small engine. One slight depression of the kick-starter, and, usually, away she goes". 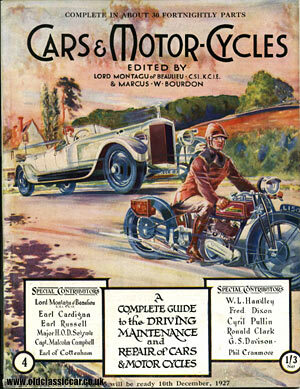 As the title of the magazine suggests, owners of both two- and four-wheeled vehicles are catered for here, unlike Newnes' Modern Motor Repair of the early 1930s, which dealt only with cars. One of the next articles in this issue discusses things to bear in mind before setting off on a continental tour in your motor-car, illustrated by photos of an Austin 7 in the Grand Chartreuse mountain range, surely a leisurely choice of motor-car for such an epic trip! The content of these magazines is a mixture of hands-on maintenance advice, general debate regarding issues of interest to the twenties' motorist, and technical insights into how and why things have been designed as they have been. Issue 4 continues with an article on identifying and fixing problems with connecting rods and pistons, and a look at the comparable costs of running a motorcycle, a motorcycle with sidecar combination, and various automobiles of the day. With so many contributors having a background in motorsport, its no surprise that competition motoring also gets a look-in within the pages of "Cars and Motor-cycles". The secretary of the Auto-Cycle Union has penned his thoughts on the organisation of competitive events, and this is followed by a guide to preparation aimed at would-be competitors in sporting trials, ie off-road events for motorcyclists. Whereas machines prepared for circuit or road events are prepared with speed in mind, the trialist needs to bear in mind the terrain that he or she is likely to encounter, with special care taken to ensure that water cannot enter either the engine or the electrical systems. Matters then return to road-going tips and advice, this issue moving on to consider how best to fit and remove tyres fitted to the various types of motor-car rim that one might encounter. Choosing a Motor House for your car. Its all very well being enthusiastic about working on your car or motorcycle, but it really helps to have somewhere dry and secure to work on your cherished machine. A series of articles printed across several issues discusses the various designs of garage, or 'motor house', that a private motorist might consider erecting, and issues of planning that will need to be tackled. Wooden garages are seen as an inexpensive solution to housing a vehicle, but the magazine also recommends those built from asbestos-cement construction (a real sign of the times! ), especially given their fire-resistant qualites when compared to wooden structures. The propensity of asbestos panels to break if given a thump is mentioned, a disadvantage when compared to wooden buildings, but the health issues surrounding asbestos dust are not mentioned, as they weren't understood in the 1920s. Asbestos garages were also described as being rather ugly, although this could be lessened by the fitting of mouldings or stained wooden latticework to the flat sides. Drive around some older roads today, and garages from the 1920s and 1930s can still be spotted, doing sterling service some 70-80 years after they were built. If only the cars or motorcycles were still parked inside! A smartly illustrated letter from one such supplier of garages in the 1930s, can be seen here in the motoring collectables section. As mentioned, these magazines were more than just a hands-on guide to vehicle maintenance. Another series of articles stretching through several issues was this one, titled Motor Bodywork, and looked into the design considerations that manufacturers had to keep in mind when working on their next model(s). The subject of ventilation is the first covered in Issue 4's installment, with various types of roof, scuttle and bonnet ventilator being discussed. Look at most modern cars, certain Rolls-Royces and Mazda sportscars apart, and the doors tend to all open in the same way - ie hinged at the front edge, latched to the rear. But in the 1920s the choice of door openings was much, err, wider, and five alternatives are shown and discussed at length. The first diagram shows car doors as they are usually mounted now, ie hinged at the front. Drawing number two shows a car with 'suicide doors' front and rear, ie all hinged on the rear pillars, allowing the driver and passengers to step directly onto their respective seats. The third option has the front doors hinged to the rear, suicide-style, and the rear doors hinged to their front edges, so that the weight of all four doors is hung onto one sturdy central pillar. This worked fine when the vehicle was new, but as time and wear entered the equation, it was common for all four doors to start sagging as the central pillar began to struggle under the weight. Choice four was to have the front doors hinged in the normal manner, and the rears to be fitted with their hinges to the rear of the car. The final door arrangement discussed here was shown in the fifth diagram, with a single door fitted to the nearside only. Front-hinged doors were generally regarded as a safer option. If a car fitted with suicide-type doors braked hard, and the doors weren't properly latched, they could fly open and the unrestrained passengers fall out into the roadway, which at best is undesirable, and is definitely lacking in dignity to say the least. Seatbelts, an invention of more recent times, might have helped in these instances! In later years, cars would often suffer with weakened ash framework. If this affected a car with rear-hinged doors, they could be prone to their doors popping open when encountering even quite mild corners, or bumps in the road, again threatening to spill their occupants and chattels onto the road. Occupants in cars with front-hinged doors didn't run this risk of falling out, as the doors tended to remain closed, or at least on their latches, one of the main reasons they became the norm in motor-car design. The illustration below came from Issue 4 of Cars & Motor-Cycles, and shows a vintage 10hp Swift motor-car, of the late 1920s.